While other kids learn their ABCs, my little rocker will be mastering her guitar chords thanks to these fantastic guitar chord blocks. A winning gift for any budding musician or music-loving parent. 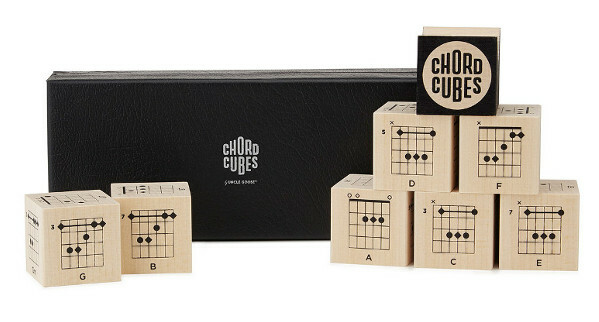 This set of nine basswood blocks contains 52 chord diagrams each printed with non-toxic inks, so it’s okay if your little one likes to channel Hendrix and go in teeth-first. The set includes chords in minor, major, and dominant 7th in open and barre configurations and the associated sharps and flats. The set comes with a v-shaped stand to hold a block at the optimal angle for viewing while playing. No strain for little necks while they strum away, learning to play. Plus a sleek black case to pack the cubes away. Very rock’n’roll. These totally excellent guitar chord blocks are handmade in Michigan, USA by Uncle Goose. Also available are ukulele chord blocks and we’ve already told you about the classic alphabet blocks. Uncle Goose display prices in USD and ship to Australia for US$66.90 but we have found you a bargain over at UncommonGoods where you can grab a set for $49.90 plus $37 for shipping to Australia.